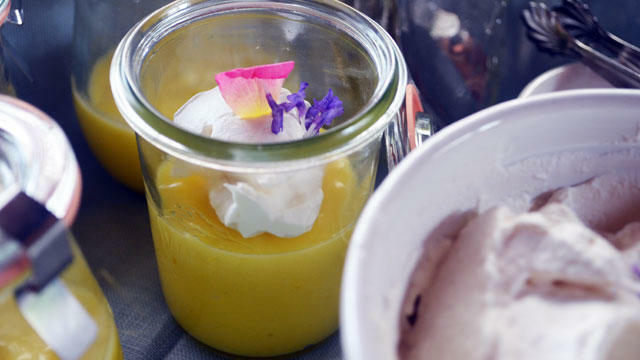 Lemon curd fan—and Associate Garden Editor—Lauren Dunec Hoang whipped up a plate-lickingly delicious dessert to savor at the end of the picnic. One of my college housemates and I had a deal. For every pie that was baked in the kitchen of our DC apartment (and trust me, there were plenty), we’d share a slice or two, and she’d get the crust and I’d get the fruit filling. We now live across the country from each other, but I still have a sweet spot for pie, and I always feel a bit guilty when I leave the crust behind on my plate. Why this recipe? When the Sunset Cookbook Club selected The Picnic for this month’s book, I knew this crust-less dessert would be right up my alley. Citrus filling and lavender cream in a jar? This dessert was meant for filling-lovers—essentially offering permission to indulge in lemon curd by the spoonful. What was it like to make it? It’s easy to make, but you’ll need a little bit of patience with all the stirring. I appreciated the short list of ingredients (eggs, sugar, lemons, butter, cream, and lavender) and the excuse to pick a bunch of Meyer lemons from our backyard tree. I doubled the ingredients to make a larger batch of curd—to eat straight out of the container later or stir into Greek yogurt for breakfast. I whisked the eggs, sugar, lemon zest, and lemon juice together in the pan of a double boiler and set it over simmering water. Next, I began stirring. It’s amazing how slowly 10 minutes can go by when you’re standing over the stove, hoping the curd will come together. No matter how many times I make lemon curd, I still have that moment when I wonder whether it will actually thicken. I passed the recommended 10-minute cooking time mark, and the lemon curd was still fairly runny—probably because I had doubled the batch. But then, voilà! After about 15 minutes, the curd really started to thicken and cling to the whisk and the sides of the pan. I gently stirred in the slices of butter and removed the pan from the heat. The rest was easy. Once the curd had cooled, I spooned it into small jars and placed them in the fridge to chill. I added a bit of dried lavender to heavy cream, let it infuse for a couple of hours, strained it, and whipped the cream. The last step: topping a few of the jars with dollops of cream and flower petals for a taste test. How did it turn out? It was pretty darn delicious. The curd was smooth and flavorful, with a nice, sharp flavor from the lemon zest. The soft cloud of not-too-sweet cream provided a perfect foil for the richness of the lemon curd. The hint of lavender in the whipped cream and the fresh flower garnish (I used rose and lavender petals) make this dessert perfect for spring. Will I make it again? Definitely. This will be my go-to recipe for lemon curd. One critique: The lavender in the whipped cream was really subtle. Next time, I might let it steep in the cream overnight. Given the time it takes spoon the curd into the jars, let the jars chill, and then spoon the whipped cream on top, this dish may be bit fussy for more spontaneous gatherings. But if you don’t mind putting the time in to do it up right, these lemon lavender cream pots are well worth the effort. Fill a medium saucepan with about 2 inches of water and bring it to a simmer over medium heat. Whisk together the eggs, egg yolks, the 2/3 cup sugar, and the zest in a large metal bowl. Whisk in the lemon juice. Place the bowl over the simmering water and cook, whisking constantly but slowly until mixture thickens to the consistency of sour cream, about 10 minutes. [My tip: If you use an instant thermometer, you’ll know it’s done when the temperature reaches 160 degrees F]. Meanwhile, add the lavender to the cream and refrigerate for 1 to 2 hours to infuse. Strain and discard the lavender and refrigerate the cream until needed. Just before leaving for the picnic, pour the cold lavender-infused cream and the remaining 1/2 teaspoon of sugar in a large metal bowl and whisk briskly until soft peaks form (when the whisk is drawn from the cream, a peak forms and curls over). Put the softly whipped cream into a sealable container to transport to the picnic. To serve, use two small spoons to make oval-shaped dollops (quenelles) of whipped cream and place one atop each lemon pot. Garnish with flowers, if using. TIP: Leftover curd? Spoon it over scones, pound cake, warm biscuits, or pancakes, roll it into crepes, or fold it into Chantilly whipped cream for an easy lemon mousse.